I’ve been busily writing a letter on oil and energy, but in the middle of the process I decided yesterday that I really needed to talk to you about the Bank of Japan’s “surprise” interest-rate move to -0.1%. And I don’t so much want to comment on the factual of the policy move as on what it means for the rest of the world, and especially the US. But before we go there, I also want to note that today is Iowa, and so we’re about to turn a big corner in what is fast becoming one of the wackiest years in American political history. I’m going to sit down tonight after the caucus results come in and write to you again, for a special edition of Thoughts from the Frontline that will hit your inbox tomorrow. Along with Iowa, I want to delve into the issue of what a “brokered convention” would mean for the Republican Party, and what one would look like. QE Failed, So Why Not Double Down? I have been steadfastly maintaining that the Bank of Japan was going to augment its quantitative easing stance sometime this spring. Inflation has not come close to their target, and the country’s growth is dismal, to say the least. So the fact that the Bank of Japan “did something” was not a surprise. I will however admit to being surprised – along with the rest of the world – that they chose to do it with negative interest rates. Especially given the fact that Kuroda-san had specifically said in testimony to parliament only a few days earlier that he was not considering negative interest rates. While this development is significant for Japan, of course, I think it has broader implications for the world; and the more I think about it, the more nervous I get. First let’s look at some facts. Jan 21 – Kuroda emphatically tells Japanese parliament he is not considering NIRP. Jan 22 – Kuroda flies to Davos. Jan 29 – Kuroda enthusiastically embraces NIRP and promises more of it if needed. So, whom did he talk to in Davos, and what did they say to change his mind? Haruhiko Kuroda, according to reports, came back from that testimony to parliament and instructed his staff to prepare a set of documents outlining all the potential choices, along with their pros and cons, to be ready for the next BOJ meeting when he got back from Davos. To pretend that he walked into that meeting without having had lengthy talks about whether to pursue negative interest rates strains credulity – and it just wouldn’t be very Japanese. The conduct of business and governance in Japan relies heavily on a process called nemawashi, or “stirring the roots”: the outcome of any important meeting is decided ahead of time through private discussions among those who will participate. In any case, the vote to take rates into negative territory came down to a razor-thin 5 to 4, so you can be damn sure Kuroda knew exactly who was with him and who was not. You do not take a vote like that and lose – not and remain chairman. The entire world has been watching the European experiment. Four countries in Europe are now at negative rates (see graph below). Two others are so close that it hardly makes a difference. The Federal Reserve and the Bank of England are both at 0.5%. Switzerland, Denmark, and Sweden all lowered their rates to make their currencies less attractive, since the franc, the krone, and the krona had appreciated too strongly against the faltering euro. Meanwhile, the ECB is trying to stimulate the Eurozone economy and create inflation. The question is, exactly how many unintended consequences will there be with negative rates? The people that NIRP (negative interest rate policy) hurts the most are those who are living on their savings or trying to grow their retirement accounts, but apparently our all-wise central banks have decided that a little pain for them is worth the potential for growth in the long run. 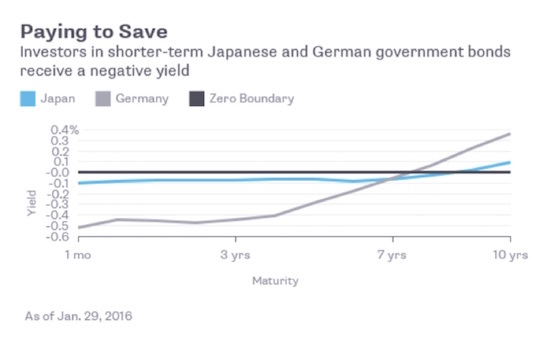 Savers in both Germany and Japan have to buy bonds out past seven years just to see a positive return. Some 29% of European bonds now carry a negative interest rate. Recently we have seen Japanese corporate bonds paying negative interest. Whatever turmoil the Bank of Japan had already created was apparently not enough to concern a majority of its board, so they have moved to negative interest rates. Let’s shift from Japan to the US. Last week, former Fed chair Ben Bernanke said in an interview that the Fed should consider using negative rates to counter the next serious downturn. “I think negative rates are something the Fed will and probably should consider if the situation arises,” he said. The same story at MarketWatch mentioned that former Fed Vice-Chairman Alan Blinder has already suggested using negative interest rates for overnight deposits. And Janet Yellen, who said in her confirmation testimony to Congress in 2013 that the potential for negative interest rates to cause disruption was significant, now says they are an option the Fed would consider. We often refer to the herd mentality when we talk about investors. 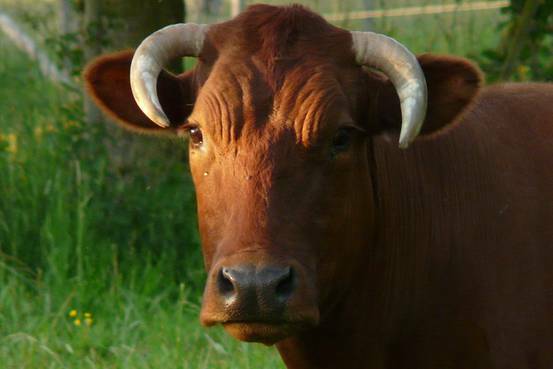 Economic academicians and central bankers are equally prone to bovine behavior. Theirs is a slow-moving herd, to be sure, but it raises much dust as it lumbers. One of the biggest “aha” moments of my life came as I listened to David Blanchflower, former Bank of England governor (during last decade’s financial crisis), in a debate a few summers ago at Camp Kotok, the Maine fishing retreat I attend every August. The debate centered around whether the Fed and the Bank of England should have engaged in quantitative easing. Blanchflower shared a rather chilling description of what was going on at the time and made the point that, as bad off as the banks were in the US, they might have been worse off in England. They were literally days from a total collapse. Liquidity had to be provided – and that is the one true and worthwhile purpose of central banks (but then they double down). Blanchflower’s argument was that you could not sit in the BOE’s meetings, see how impossible the situation was, and do nothing. You had to act. In such a predicament you rely upon your best instincts and education and training, and then you act. And you hope that the actions you take do more good than harm. Now, let’s fast-forward right into the future and the next recession in the US, which will probably be part and parcel of a global recession. Major central banks everywhere will be lowering rates, engaging in quantitative easing, and in some cases going even deeper into negative interest rates. You sit on the Federal Open Market Committee. Almost everyone in the room with you is a committed Keynesian. That is the bulk of your training and experience, too, and everyone agrees with you. You are going to take actions that are in alignment with your theoretical understanding of how the world works. And your theory says that you need to reduce the cost of money so that people will borrow and spend. You know that doing so will hurt savers, but it is more important that you get the economy moving again. What do you do? You are hearing from everyone that the dollar is too strong and is hurting US business. You worry about the unintended consequences of taking the world’s reserve currency into negative-interest-rate territory, but the staff economists are handing you papers that argue persuasively that the best possible alternative is negative rates. So you throw in the towel. Which is pretty much the situation Kuroda-san was in when he came back from Davos – his staff economists (who have had much the same training as the Fed economists have) were waiting for him. Yes, and he may have received assurances from the central bankers of other countries who have already gone negative, but you don’t make such a decision based on a few conversations. Kuroda had been thinking about negative rates for a long time. You have to understand that in the world of truly elite economists, everyone knows everyone. Many of them went to the same schools, and they regularly talk at conferences, in private meetings, and by phone and email. I can guarantee you that they are talking about if and when it might be necessary for the US to go down the path of negative interest rates. The policy makers are not committed to following that path, but they are certainly talking about it. When they tell us it’s an option, we need to take them seriously. I have been in the room (under Chatham House rules, so I cannot reveal when or where or who) with some of the world’s most elite economists (Nobel laureates, etc. ), who were privately advocating that the US should pursue not just 2% but 4% inflation. This is not the language I hear when they are interviewed in public. They very well get the seriousness of our current economic predicament, but their academic theory tells them that the way to resolve that predicament is with more quantitative easing and even lower rates. You need to understand that economists have faith in their theories in the same way that many people have faith in their religion. We need to seriously contemplate and war-game in our investment committee meetings, in meetings with our investment advisors, etc., what negative interest rates would mean for our portfolios. You do not want to wait until the last minute, when negative rates are already an adopted policy, to try to react. NIRP is not going to happen in the US this week or this month, and I seriously doubt we’ll even see negative rates this year; but if it’s on the table at the Federal Reserve, then you need to have it on the table as a distinct possibility. The Fed could achieve negative rates quickly. Currently the Fed is paying the depository institutions 25 basis points for the $2.5 trillion in excess reserves they are holding. The Fed could quit paying this interest and instead charge the banks a safekeeping fee of 25 basis points or some other amount. This would force yields on other short-term rates downward as the banks, businesses and households try to avoid paying for the privilege of holding short-term assets. No guarantees exist that such an action would be efficacious. Heavily indebted economies are not very responsive to such small changes in short-term interest rates. Many negatives would outweigh any initially positive psychological response. Currency in circulation would rise sharply in this situation, which would depress money growth. The Fed may try to offset such currency drains, but this would only be achievable by further expanding the Fed’s already massive balance sheet. If financial markets considered such a policy inflationary over the short-term, the more critically sensitive long-term yields could rise and therefore dampen economic growth. An extended period of negative interest rates would lead to many adverse unintended consequences just as with QE and ZIRP. The initial and knockoff effects of negative interest rates would impair bank earnings. Income to households and small businesses that hold the vast majority of their assets with these institutions would also be reduced. As time passed a substantial disintermediation of funds from the depository institutions and the money market mutual funds into currency would arise. The insurance companies would also be severely challenged, although not as quickly. Liabilities of pension funds would soar, causing them to be vastly underfunded. The implications on corporate capital expenditures and employment can simply not be calculated. The negative interest might also boost speculation and reallocation of funds into risk assets, resulting in a further misallocation of capital during a time of greatly increased corporate balance sheet and income statement deterioration. The math is too simple to ignore. Potential labor force growth will average ½% per year for at least the next decade, and US labor productivity growth may well stay around ½% a year, its rough average for the last five years. These add up to 1% long-term potential GDP growth, which actual GDP growth can surpass only temporarily during a cyclical upswing – and certainly not during a cyclical slowdown. This is a challenging problem, with demographics practically set in stone, and a boost to productivity growth realistically possible only in the long run. Consequently, after years of ZIRP and QE attempting to pull demand forward from the future, central banks are increasingly powerless when it comes to the economy itself. They can “print” money, but not economic growth. The world is watching, so those who are thought to walk on water cannot afford to be seen to have feet of clay. If U.S. growth keeps slowing this year, recession risk will rise, and the Fed will likely revisit ZIRP, in one way or another. The failure of Abenomics is not inevitable, but appears increasingly probable. And while China is not yet facing a hard landing, growth continues to slow, raising legitimate concerns about its leaders’ capability to avoid one. By clinging to unrealistic growth expectations, the economic establishment has effectively bet everything on the success of these grand experiments, and the risk of losing that bet is rising inexorably. Ultimately, only policies that genuinely address the challenges of demographics and productivity have a chance to succeed. It is high time for that discussion to begin. Lakshman is right, but we are not really going to get that discussion, except in the context of Keynesian policy. Which is at the very heart of the problem. There would have to be an admission of failure by the economic establishment in order for there to be a serious discussion. It would be like asking the Pope and all his priests to convert to another theological viewpoint. Here and there it could happen, but a mass shift? In the world of the leading economists and central bankers, “everyone” believes what “everyone” knows to be true. All their research agrees with them, and any that doesn’t is labeled as flawed. Any empirical evidence that shows quantitative easing hasn’t been working is ignored or explained away, even when it is presented by outstanding academic economists. No, quantitative easing didn’t work because we didn’t do enough of it. Negative interest rates aren’t working because we haven’t gone low enough. Clearly, QE has not worked. We have not had one year of 3%+ growth since the Great Recession and are barely averaging 2%. Yes, if your measure is the stock market and other financial assets that have inflated, then QE has worked quite well. But the boost QE was supposed to deliver just hasn’t reached Main Street. One of the basic tenets of QE and other related policies is that if you want to increase consumption, you lower the cost of borrowing. But if out-of-control borrowing was the original problem, then QE as a solution is kind of like drinking more whiskey in order to sober up. And if you reduce the earnings of those who are savers so that they are no longer able to spend, the whole purpose of the original project – to foster economic growth – is defeated. But we can’t acknowledge that, because if we did, we’d have to admit that our theories don’t work. And we all know, because God knows, that our theories are correct. The theme of negative interest rates is one we are going to come back to again and again. We have little idea what NIRP’s unintended consequences to our portfolios and to our businesses will ultimately be, but we had better start thinking them through. I know we have been pushing early registration for my conference rather heavily in the past few weeks, and I want to thank the large number of people who have already signed up. It is going to be a dynamite conference. I really am putting together a fabulous lineup to discuss critical economic trends and policies like the ones we covered in this letter. And we will have a fair representation of those who believe that QE has been precisely what was needed and has been successful. We will get both sides of the argument. I am really not so much interested in trying to determine the correctness of one belief or another at the conference as I am in discerning the practical implications for our investment portfolios and discussing how those of us who are in the money management business need to position our clients. NIRP-proofing our portfolios is a most vexing conundrum. Wednesday we fly to the Cayman Islands, where I’ll speak at the Cayman Alternative Investment Summit, one of the biggest hedge fund and alternative investment gatherings outside of the US. They have an impressive lineup of speakers, and I note that this year the celebrity guest speakers are Jay Leno and the star of my all-time favorite movie, Trading Places – Jamie Lee Curtis. That should be fun. I just looked through the speaker list and noticed that Pippa Malmgren, who will also be at my SIC conference, is speaking, and it will be fun to catch up with her again. I will be on a panel (moderated by KPMG chief economist Constance Hunter) with old and brilliant friends Nouriel Roubini and Raoul Pal. At least I know that with those two guys there is no need to wear a tie. Don’t tell the conference organizers this, but I will probably be paid more per word for this panel than I have ever been paid in my life. That is because with these three I will be lucky to get a word in edgewise. Theoretically, unless the Chinese central bank decides to go to negative rates, I will write about oil next week. In surprising markets by penalizing a portion of banks' reserves, the Bank of Japan on Friday joined a growing club taking the once-anathema step of pushing some borrowing costs beneath zero. "Negative rates are now very much the new normal," said Gabriel Stein, an economist at Oxford Economics Ltd. in London. "We've seen they are possible and we're going to see more." Negative rates once "sounded illogical," said Stein. "We now know what we thought was true isn't." This is a resounding admission of failure. Over the past seven years the world's central banks have cut interest rates to levels not seen since the Great Depression and flooded their banking systems with newly-created currency, while national governments have borrowed unprecedented sums (in the US case doubling the federal debt). Yet here we are in the early stages of a global deflationary collapse. Commodity prices have followed interest rates to historic lows, while growth is anemic and may soon be nonexistent. Future historians will have a ball psychoanalyzing the people making these decisions, and their conclusion will almost certainly be some variant of the popular definition of insanity as repeating the same behavior while expecting a different result. So what does this new stage of the Money Bubble mean? Many, many bad things. This latest leg down in bond yields presents savers (the forgotten victims of the QE/NIRP experiment) with an even tougher set of choices. Previously they were advised to move out on the risk spectrum by loading up on junk bonds and high-dividend equities. Now, after the past few months' carnage in those sectors, even the most oblivious retiree is likely to balk. But having said "no thanks" to the demonstrably dangerous options, what's left? The answer is...very little. There is literally no way remaining for a regular person to generate historically normal levels of low-risk cash income. Meanwhile, a NIRP world presents the US with a problem that perhaps only the Swiss can appreciate: As the other major countries aggressively devalue their currencies (the euro and yen are already down big versus the dollar), another round of lower interest rates and faster money printing will, other things being equal, raise the dollar's exchange rate even further. For a sense of what that might mean, recall that US corporate profits are already falling because of a too-strong dollar (see Brace for a 'rare' recession in corporate profits). Bump the dollar up another 10% versus the euro, yen and yuan, and US corporate profits might fall off a cliff. The inevitable result: Before the end of the year, the US will see no alternative but to open a new front in the currency war with negative interest rates of its own. The big banks, meanwhile, are no longer feeling the central bank love. Where falling interest rates used to be good for lenders because they energized borrowers and widened loan spreads, ultra-low rates are making markets more volatile (and thus harder to profitably manipulate for bank trading desks) without bringing attractive new borrowers through the door. The result: falling profits at BofA, JP Morgan, Goldman, et al and tanking big-bank share prices. 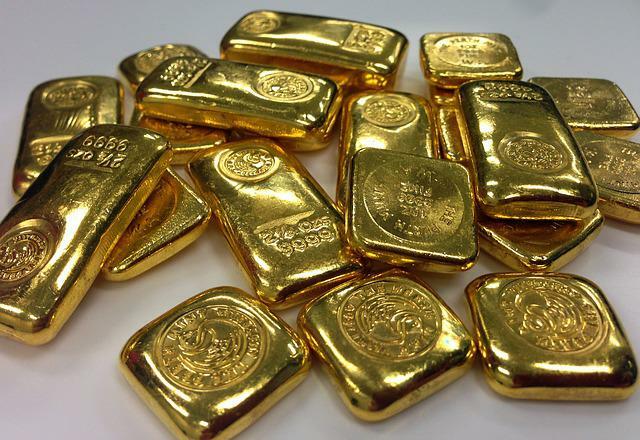 As for gold, there are now $5 trillion of bonds and bank accounts that cost about the same amount to own as bullion stored in a super-safe vault -- and which cost more than gold and silver coins stored at home. Compared with the 5%-6% cash flow advantage that bonds have traditionally enjoyed versus gold, NIRP can't help but lead savers and conservative investors to reconsider their options. In other words, what would you rather trust: A bond issued by a government (Japan, the US, Europe -- take your pick) that is wildly-overleveraged and acting ever-more-erratically, or a form of money that has never in three thousand years suffered from inflation or counterparty risk? At some point in the process, a critical mass of people will get this. And no discussion of the unfolding financial mess would make complete sense if it left out the geopolitical backdrop. The Middle East is on fire and refugees are flooding the developed world, resurrecting old social pathologies (see Swedes storm occupied Stockholm train station, beat migrant children). Much of Latin America is sinking into chaos (see Caracas named as world's most violent city and 21 of the 50 most violent cities are in Brazil). Seeing this, who in their right mind would spend thousands of dollars to visit Egypt or Rio or even Paris right now? The answer is far fewer than a decade ago. So the old reliable economic drivers of expanding global trade and enthusiastic tourism are gone for a while, if not for decades. Central banks are, as a result, swimming against a current that is far faster -- in water that is far deeper -- than anything seen since at least the 1930s. And all they can do is pump a bit more air into their sadly-inadequate water wings. The comatose mining stocks finally came to life today and showed signs of some determined buying, something that has been missing in the recent leg higher in the gold market. From a technical analysis perspective, the fact that they were able not only to breach that stubborn band of resistance near 125 which has kept them in check, but also managed to soar through the mid-July 2015 low near 128 is very impressive. All that they need to do now is to take out 140 on a closing basis and we can say that they have bottomed out on a medium term basis. Short term they remain bullish now that they have bettered those two aforementioned resistance levels. The reason I have not yet turned bullish on the miners on a medium term basis is because of the following medium-term chart. As you can see when you pan out and take a bit of a longer term view, the current move higher in the HUI is not all that impressive. The HUI has not had a weekly close above that line marked "MAJOR RESISTANCE" since early July of last year. A close through that would turn me bullish on a medium term time frame especially if the close involved being above the October 2014 spike low near 145-146. This rally may present an opportunity in the days ahead for those who are still holding an excessively lopsided position in the gold shares to whittle that down somewhat so that they can diversify and perhaps rebalance their portfolios. That being said, you would want to watch for some signs that the rally in gold has run its course, something which as of yet it has given no indication it is ready to do. The big thing supporting the gold market at the moment is the turmoil in the foreign exchange markets which is resulting in massive deleveraging and unwinding of large positions in one direction, namely short most major currencies and long the US Dollar. As the market comes to terms with the idea that the Fed is not going to make a move in their upcoming March meeting, the dial-back in interest rate differential expectations is forcing this repositioning. That of course is resulting in large scale US Dollar selling. What is going to be incredibly fascinating to watch play out is the response from the European Central Bank and the Bank of Japan. Neither one of them can be the least bit pleased to see their respective currencies surging higher especially after both, but especially the BOJ, only just recently announced their displeasure with the Yen at current levels. We also know from the recent Mario Draghi remarks, that the ECB is incredibly frustrated with the lack of inflationary pressures across the Eurozone with Mr. Draghi repeatedly making a point of telling us all how their statisticians were going to have to lower their estimates for inflation for not only this year but also on out into 2017 and even 2018. The LAST THING they now want to see is the Euro at current levels. This is really coming down to a battle or more properly a war, between speculative interests and those two Central Banks which have made it clear that a major component, if not the major component of their plans to combat deflation and stave off a sluggish growth model is by weakening their respective currencies. With specs repositioning and being forced out of existing short positions, the sheer size of the leveraged carry trades involving those two currencies, the Yen and the Euro, is going to make defeating this unwind quite a feat. I know that the Bank of Japan is not afraid to take on the specs but when it comes to the ECB, that is entirely another different matter. Their resolve is always iffy for among currency traders they do not have near the respect that the mere mention of the BOJ engenders. As far as gold itself goes, the metal has now run exactly to where the next chart level of resistance can be found. Notice the downsloping trend line as it intersects with the lows made in March of last year. A push through this level will set up a legitimate shot at the October highs near $1190. 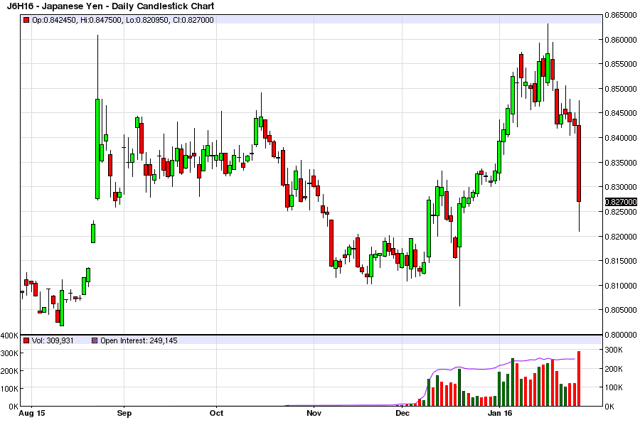 Get through that and the medium term complexion of the gold chart will have changed. When the bull resumes, strong stocks are supposed to re-emerge as leaders. But not this time. Relative performance analysis, also known as relative strength, tells us which stocks are leading in any market environment. Theoretically, the stocks that hold up best as the market pulls back are the ones that will lead when the correction ends. After all, if investors like a stock, it will be the last one sold in times of uncertainty. That’s indicative of demand. Unfortunately, the stocks that are leading in the market bounce that began two weeks ago are not the prior winners. With exception, most are stocks that were the most beaten down. The only conclusion I can draw is that bargain hunters are driving the rebound and a real change of mood to the bullish side is not happening. Let’s start with the good news. Of the so-called FANG stocks – Facebook, Amazon.com, Netflix and the former Google, now called Alphabet, two, Facebook and Alphabet are back in new high ground and outperforming the market. Today, Alphabet announced better-than-expected results and shares soared after the close to a record high. Relative performance or relative strength is simply a ratio of two stocks or a stock to an index. 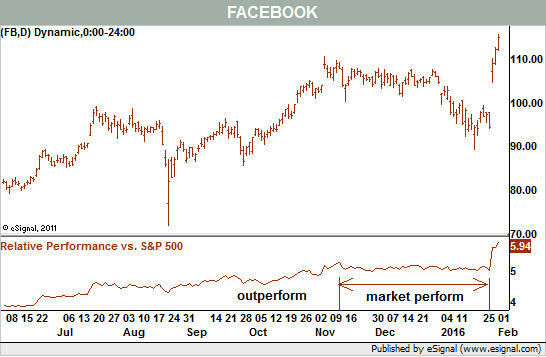 If the performance of the first item – Facebook - is better than the second - the market - then the relative performance chart slopes higher. If the relative performance chart starts to change, technical analysts get a potential early warning signal that the stock may be about the change course for the worse. While Facebook did pull back between November and January its relative performance vs. the Standard & Poor’s 500 remained flat (see Chart 1). In other words, after months of outperforming the market, all this stock did was take a breather by merely matching the market. Compare that to Apple. 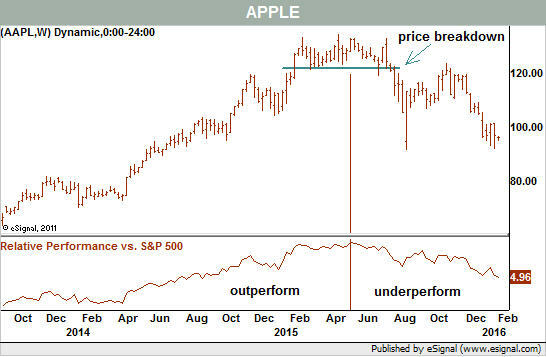 Its relative performance chart peaked in May 2015 and did forewarn that the bullish trend was over even though prices remained flat for several more weeks (see Chart 2). With Alphabet’s rally today, Apple is no longer the biggest company by market capitalization. This is important because the gang of four FANGs was widely recognized to be the market’s hot stock group. With only two coming out of corrections with strength, this leadership group is really not leading anymore. Long before the FANG acronym was in vogue, there was a group some called the market’s generals. It included the four FANGs and added such stocks as coffee purveyor Starbucks , biotech leader Gilead Sciences, sneaker maker Nike and, of course, AppleAAPL in Your Value Your Change Short position . The list is subjective as everyone had their own favorite leaders but the concept was the same. As goes the generals, so go the soldiers. 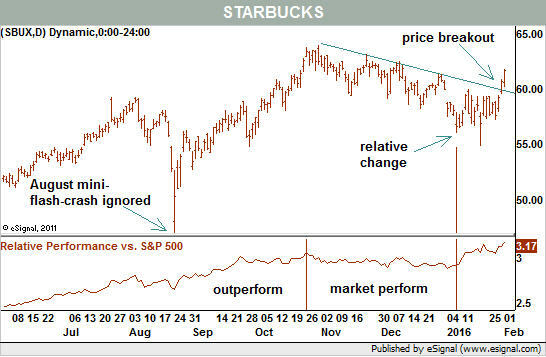 Right now, we can argue for the return of Starbucks to the fore with its strong breakout from a three-month slide (see Chart 3). It sports a clear change of trend, supported by such technicals as rising on-balance volume and relative strength. Also, its decline, while drawn out, was rather mild just as we’d expect from a leader. The bad news is that a very large percentage of the stocks that populate the leaderboards right now are not quite the same as these generals. Monday morning, the percent price leaders on the New York Stock Exchange excluding stocks involved in takeover activity were mostly last year’s biggest losers. For example, US Steel ( USX ) was up nearly 5% intraday but it set a 52-week low last week. Blood management company Haemonetics released good third quarter results before the bell and the stock jumped over 8% in short order. Here, too, it traded at a 52-week low in January after losing a third of its value since last March. That is not exactly a surge back into a strong stock. Rather, it is hope for a technical turnaround that may or may not happen. The leaders list is littered with gold stocks and biotechs. The former may be stabilizing after a bear market and the latter have been falling since last summer. The rush back to scoop up good stocks at cheaper prices so far is absent. The point is that these are losers that got some interest and not leaders that are back in the lead. That’s not a good condition for the bulls. The End of the New Normal? WASHINGTON, DC – Just when the notion that Western economies are settling into a “new normal” of low growth gained mainstream acceptance, doubts about its continued relevance have begun to emerge. Instead, the world may be headed toward an economic and financial crossroads, with the direction taken depending on key policy decisions. In the early days of 2009, the “new normal” was on virtually no one’s radar. Of course, the global financial crisis that had erupted a few months earlier threw the world economy into turmoil, causing output to contract, unemployment to surge, and trade to collapse. Dysfunction was evident in even the most stable and sophisticated segments of financial markets. Yet most people’s instinct was to characterize the shock as temporary and reversible – a V-shape disruption, featuring a sharp downturn and a rapid recovery. After all, the crisis had originated in the advanced economies, which are accustomed to managing business cycles, rather than in the emerging-market countries, where structural and secular forces dominate. The concept received a rather frosty reception in academic and policy circles – an understandable response, given strong conditioning to think and act cyclically. Few were ready to admit that the advanced economies had bet the farm on the wrong growth model, much less that they should look to the emerging economies for insight into structural impediments to growth, including debt overhangs and excessive inequalities. But the economy was not bouncing back. On the contrary, not only did slow growth and high unemployment persist for years, but the inequality trifecta (income, wealth, and opportunity) worsened as well. The consequences extended beyond economics and finance, straining regional political arrangements, amplifying national political dysfunction, and fueling the rise of anti-establishment parties and movements. Today, it is no longer unusual to suggest that the West could linger in a low-level growth equilibrium for an unusually prolonged period. Yet, as I explain in my new book The Only Game in Town: Central Banks, Instability, and Avoiding the Next Collapse, growing internal tensions and contradictions, together with over-reliance on monetary policy, are destabilizing that equilibrium. Indeed, with financial bubbles growing, the nature of financial risk morphing, inequality worsening, and non-traditional – and in some cases extreme – political forces continuing to gain traction, the calming influence of unconventional monetary policies is being stretched to its limits. The prospect that such policies will be able to keep the economic engines humming, even at low levels, looks increasingly dim. Instead, the world economy seems to be headed for another crossroads, which I expect it to reach within the next three years. This may not be a bad thing. If policymakers implement a more comprehensive response, they can put their economies on a more stable and prosperous path – one of high inclusive growth, declining inequality, and genuine financial stability. Such a policy response would have to include pro-growth structural reforms (such as higher infrastructure investment, a tax overhaul, and labor retooling), more responsive fiscal policy, relief for pockets of excessive indebtedness, and improved global coordination. This, together with technological innovations and the deployment of sidelined corporate cash, would unleash productive capacity, producing faster and more inclusive growth, while validating asset prices, which are now artificially elevated. The alternate path, onto which continued political dysfunction would push the world, leads through a thicket of parochial and uncoordinated policies to economic recession, greater inequality, and severe financial instability. Beyond harming the economic wellbeing of current and future generations, this outcome would undermine social and political cohesion. There is nothing pre-destined about which of these two paths will be taken. Indeed, as it stands, the choice is frustratingly impossible to predict. But in the coming months, as policymakers face intensifying financial volatility, we will see some clues concerning how things will play out. The hope is that they point to a more systematic – and thus effective – policy approach. The fear is that policies will fail to pivot away from excessive reliance on central banks, and end up looking back to the new normal, with all of its limitations and frustrations, as a period of relative calm and wellbeing. The Bank Of Japan - Ringing In The Endgame? - Over the past four years, the BoJ has thrown all remaining caution to the wind, with the declared goal of reviving Japan's economy and creating an annual "inflation" rate of 2%. However, it seems now that even that was not enough just yet! - The BoJ has certainly succeeded in devaluing the yen's external value and impoverishing Japan's citizens accordingly. It has also created a short-term windfall for people buying Japanese stocks. - After assuring everyone that the BoJ saw no need to add to its already enormous debt monetization program, Mr. Kuroda seems to have been convinced by recent market volatility that it was time to move on from an insane monetary policy to even more insane monetary policy. - It appears to us that the ever more desperate monetary policy measures adopted by the BoJ are coming closer and closer to crossing a point of no return. In other words, the BoJ seems to be entering what is popularly known as the "Keynesian endgame". It is the Keynesian mantra: the fact that the policies recommended by Keynesians and monetarists, i.e., deficit spending and money printing, routinely fail to bring about the desired results is not seen as proof that they simply don't work. It is regarded as evidence that there hasn't been enough spending and printing yet. The Nikkei Index from 1989 to 2003. Japan's seemingly never-ending boom coupled with forever rising stock prices, carefully administered by Tokyo's powerful bureaucrats, suddenly became an intractable bust. This sudden change in fortunes should perhaps have been taken as a hint that central planning of the economy wasn't such a good idea after all. That was not the conclusion of Japan's movers and shakers, though (or anyone else's, for that matter). Instead, it was decided that what was required were better planners, or at least a better plan. For decades, Japanese policymakers have been inundated with well-meaning advice by prominent Western economists. Even Ben Bernanke famously admonished them to just print more. According to Bernanke, holding interest rates at zero and implementing several iterations of QE were indicative of "policy paralysis" - after all, these efforts were obviously just not big and bold enough! 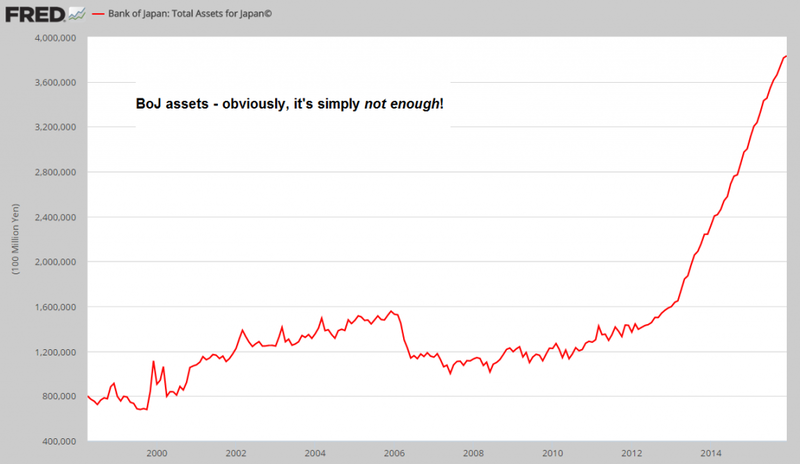 Assets held by the Bank of Japan: since Kuroda has started this "QE on steroids" program in 2012, the central bank's balance sheet has grown in parabolic fashion. In short, over the past four years, the BoJ has thrown all remaining caution to the wind, with the declared goal of reviving Japan's economy and creating an annual "inflation" rate of 2%. However, it seems now that even that was not enough just yet! As an aside to this: no-one knows or can sensibly explain what lowering the purchasing power of one's currency by exactly 2% p.a. is supposed to achieve. There exists neither theoretical nor empirical evidence that could possibly support the notion that it is a desirable goal. It is just another Keynesian mantra. Central bankers have basically pulled the 2% figure out of their hats. The most recent data point of the BoJ-engineered "recovery": machinery orders plunge by 14.4%. Japan's manufacturing production, monthly annualized growth rate - the December data haven't been released yet, but in light of last quarter's machinery orders, production growth will likely be back in negative territory. Japan's consumer price inflation rate, month-on-month. No dice, so far. "The Bank of Japan unexpectedly cut a benchmark interest rate below zero on Friday, stunning investors with another bold move to stimulate the economy as volatile markets and slowing global growth threaten its efforts to overcome deflation. Global equities jumped, the yen tumbled and sovereign bonds rallied after the BOJ said it would charge for a portion of bank reserves parked with the institution, an aggressive policy pioneered by the European Central Bank (ECB). "What's important is to show people that the BOJ is strongly committed to achieving 2 percent inflation and that it will do whatever it takes to achieve it," BOJ Governor Haruhiko Kuroda told a news conference after the decisión. Obviously, the BoJ cannot allow Draghi to get away with imposing policies that are even more crazy than its own. So it has now caught up with the lunatics running the monetary asylum in Europe. It is actually quite amusing that this admission of the complete failure of the policies implemented to date apparently caused stock markets to rally. JGB yields declined by more than 56% (!) on the day to a mere 10 basis points, and the yen got kneecapped, surrendering much of the gains it has achieved in recent weeks. JGB yields plunge by 13 basis points to just 10 basis points - a loss of 56% in just one trading day. The yen is murdered, surrendering a large part of the gains it has made since early December. As to the BoJ's commitment to "achieve inflation", it may well end one day with price inflation going from zero to infinity in the space of a few months. Kuroda should be thankful that Japan's citizens haven't lost confidence in the currency yet in spite of his efforts; one of these days they will, and then it will probably be "game over" in a flash. Japan's narrow money supply M1 since the 1950s. 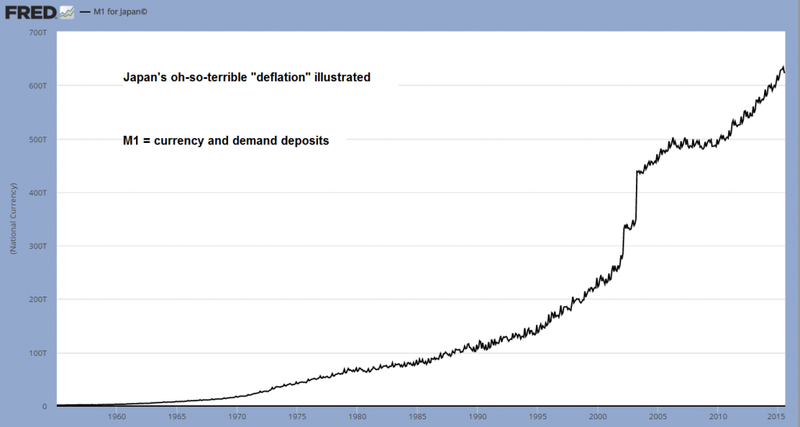 What terrible, terrible deflation! "In adopting negative interest rates Japan is reaching for a new weapon in its long battle against deflation, which since the 1990s have discouraged consumers from buying big because they expect prices to fall further. 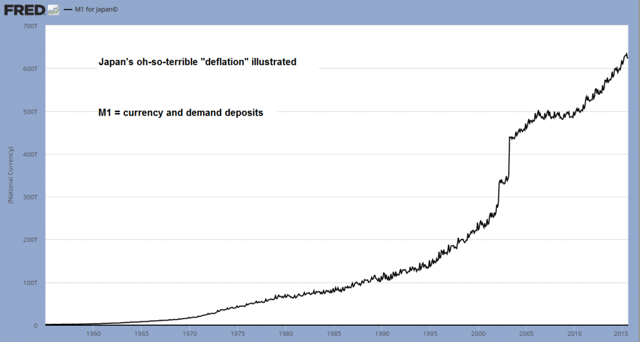 Deflation is seen as the root of two decades of economic malaise." This shows how utterly divorced from reality today's mainstream economists and central bankers are - not to mention how lazy financial journalists are, who never seem to question this nonsense. The above assertion even flies into the face of economics 101. People buy less when prices decline? Since when? In what universe? Japanese consumers are allegedly waiting since the 1990s for "prices to fall further"? To call this utter bullsh*t feels almost like an insult to bullsh*t.
We guess the billions of people in the world who keep buying smart phones, computers, TV sets and all the other things that are continually falling in price in spite of the ministrations of central bankers must represent the "exception from the rule". Japan's consumer price index has recently reached a new multi-decade high. Shouldn't the central bank be glad that prices have actually been stable for so long? "Kuroda said the world's third-biggest economy was recovering moderately and the underlying price trend was rising steadily. "But there's a risk recent further falls in oil prices, uncertainty over emerging economies, including China, and global market instability could hurt business confidence and delay the eradication of people's deflationary mindset," he said. "The BOJ decided to adopt negative interest rates… to forestall such risks from materializing." Neither zero nor negative originary interest could possibly exist in an unhampered free market economy. Time preference cannot become zero or negative. Conceivably it could become zero if one were to fall into a black hole (it is theorized that no time passes there), or if scarcity were completely eliminated one day and no economic or technological progress would be seen as possible anymore. Neither of these hypothetical cases will ever be of practical importance. "Not the impossible disappearance of originary interest, but the abolition of payment of interest to the owners of capital, would result in capital consumption. The capitalists would consume their capital goods and their capital precisely because there is originary interest and present want-satisfaction is preferred to later satisfaction. Therefore there cannot be any question of abolishing interest by any institutions, laws, and devices of bank manipulation. He who wants to "abolish" interest will have to induce people to value an apple available in a hundred years no less than a present apple. What can be abolished by laws and decrees is merely the right of the capitalists to receive interest. But such laws would bring about capital consumption and would very soon throw mankind back into the original state of natural poverty." As we have always said in these pages, the cunning plan of the mad hatters running the world's central banks seems to consist of making people richer by making them poorer. One can safely assume that they haven't really thought this one through. It appears to us that the ever more desperate monetary policy measures adopted by the BoJ are coming closer and closer to crossing a point of no return. In other words, the BoJ seems to be entering what is popularly known as the "Keynesian endgame". Once the threshold beyond which confidence is finally lost is crossed, the long maintained sophisticated fiat money Ponzi scheme and the associated three card Monte played between central banks, commercial banks and government treasuries will come to a screeching halt. Naturally, we cannot tell you where this threshold precisely lies or how quickly said "endgame" will be playing out. Nor do we know with any precision what gyrations we may yet see as the situation evolves. We do, however, know that Kuroda's decision has brought the world another step closer to the end. It would be a dangerous error to believe that such policies can be adopted without inviting severe consequences. Kuroda is a member of a small coterie of central planners running the world's currency systems, who are completely divorced from reality and are playing with the savings and lives of millions. They are implementing extremely risky experiments and evidently haven't even the faintest inkling of what the ultimate outcome will be. Unfortunately, none of us can do anything to stop them. It is therefore vitally important that one make a plan for oneself. It is quite ironic actually: the very people the economy depends on the most with respect to wealth creation are also most likely to be terrified by these developments. Consequently, they are likely to withdraw more and more from genuine wealth creation activities. They will simply be far too busy trying to save themselves while it's still possible.